The Organic Box provides hundreds of dollars’ worth of produce to our kitchens every week. They have also shared their passion for helping our youth with their Food Family initiative, which has led to donations of over $13,000. Sift together flour(s), baking soda, salt, cinnamon and ginger. Set aside. Whisk together brown sugar and coconut oil. Beat in the applesauce and yogurt until fully combined. Add the eggs, one at a time and then the vanilla. Using a spatula, stir the dry ingredients into the wet ingredients until just combined. Fold in the carrots, raisins and walnuts. 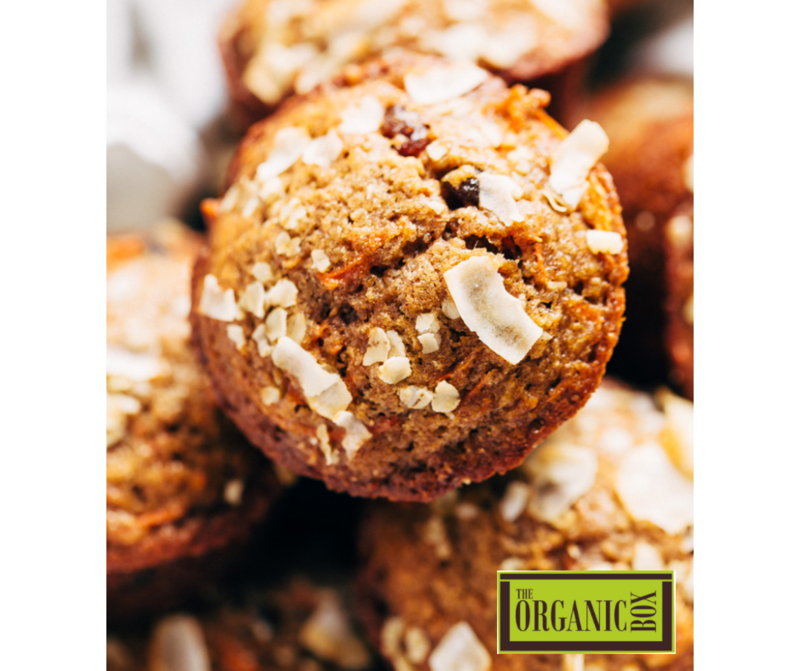 Fill muffin cups 3/4 full and top with shaved coconut or rolled oats if desired. Bake for 20-25 minutes or until a toothpick comes out cleanly. Cool to room temperature before enjoying.